The first strike in the jute industry took place in 1928 in Bengal's Ludlow Jute Mill at Chengail and later in Fort Gloucester Jute Mill in Bauria, which went on for six months. The strikes, led by Bankim Mukherjee, Radharaman Mitra, Gopen Chakraborty, Kishorilal Ghosh and Philip Spratt got the workers some of their demands, but played a big role in laying the grounds for heightened consciousness among workers, leading to the first general jute workers strike in July-August 1929. To protest against the move to lay off 60,000 workers by increasing work hours and more shifts, the strike call was given by Bengal Jute Workers Union with Dr Prabhabati Das Gupta as its president. The union also had communist leaders like Abdul Momin, Abdur Rezzak Khan, Kali Sen , Bankim Mukherjee, Moni Singh among others. 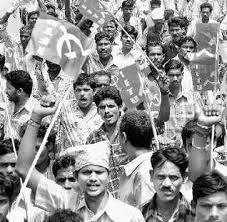 The strike, which began from Alambazar and Baranagar soon spread with about 1,92,000 workers joining it. This was the first united struggle in the jute industry and forced the mill owners to postpone their plan to retrench workers and increase work hours, but later an agreement by the union president with the owners created some cracks in workers unity.Yet, it was this first general strike in 1929 that created a strong sense of unity among millions of jute workers and made them conscious about their rights and the need to build an organisation.